Now that's a Yellow Strat! 2004 Fender Graffiti Yellow body with 2010 MIM neck and new hdwr. I'll say it again-- "Now that's a yellow Strat!" 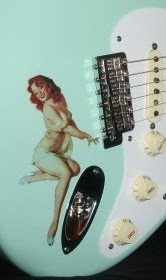 stratconnection.com specializes in Strat & Tele parts. They configured our Friday feature here for somebody somewhere who just might go bananas over a completely yellow Strat. Of course, gold hardware makes sense too. And as the maple ages and eventually tints, the whole thing will meld into some kind of rich carmelized six string lemon bar of Stratoliciousness. "They call it mellow yellow-- quite rightly."